For many years now I have operated in and advised target driven organisations. I’m competitive, I like to know where I am going and being focused on getting there. So there is something about targets that suits me. However, I have observed targets have the potential to adversely distort behaviour and damage potential, just as much as they ever can inspire. I think we need to take control of the targets, otherwise they take control of us. Let me start with an organisation that is very growth driven. Nothing wrong with a focus on growth in itself, but this organisation completely ignores customer retention in its recognition programme. So all the energy of its people go into getting more and more customers. A fraction of that energy goes into retaining them. Their people explain huge customer losses away by saying that customers can’t be relied upon to stay around, so you have to get more of them if you want to keep the numbers up. What is missing here is purpose – this organisation exists to serve the customers, not to pursue mindless growth targets, and all the time they ignore customer retention, they will struggle to achieve their purpose. What is your organisation’s purpose? Do your targets serve that purpose or distract from it? Are you prepared to challenge the comfortable assumptions and take control of these targets? People develop through stretching themselves, finding new ways to do things, learning from mistakes and doing better the next time. If we allow ourselves to be controlled by targets that are not particularly stretching, then we limit the extent to which we develop. One client of mine has performance targets for all of its teams. For most of the teams these targets are really easy – they can meet them with their eyes closed lying on sun lounger with a Pina Colada. So they do just enough to get over the line, celebrate a little (not too much because it really isn’t a big deal) and get on with other things. We need to be setting ourselves targets that stretch. Targets that take into account how we have done in the past and what our current circumstances are. Targets that reward effort and learning. If we have the power to influence official targets, then that’s great. If not, then we can set our own goals to take our own control back. In a number of companies that I know, people will hold back achievements (like sales or production levels) until the next period in time, because they have already fulfilled the requirements for the current period. They also want to make it easier to deliver results in the next period of time. So the records of achievement don’t reflect what really happened or could have happened, they only reflect what people chose to register. Because they are holding back registering achievement, they are holding back achieving. In this organisation there are some “rebels” who are starting to get attention – they don’t allow themselves to be held back and track their own achievement beyond the limits set. Suddenly people are beginning to realise that these “rebels” are starting to run fantastic operations that others can learn from and emulate. Is this kind of holding back happening where you work? Are you being held back in your ability to achieve because of distortions like this? Can you take control, move beyond those targets and inspire others instead? I remember visiting a contact centre where the screens were switched off when they were supposed to be showing customer waiting times. Why? Because the figures would depress the staff, they said. Supposing the targets are too stretching? Don’t reward you for effort or growth? The risk is that teams become despondent and give up. They decide that there is no way they can reach the target so there is no point in trying. The trick here is to evaluate what you can do to move closer to the target, to record and celebrate incremental movements in the right direction and to keep moving. It seems to me that every world record in sport looks unachievable before it is broken (for example the 4 minute mile), and after that lots of people break that barrier because someone has proved that it can be done. Have you given up on a target? Can you reset your expectations to learn from more incremental movements in the right direction, and celebrate each incremental move as it happens? Maybe you will outstrip those who were finding it easy because you are the one who is really thinking and learning. I have been involved in a number of organisations that deliberately set teams up in competition, even conflict, against each other. The idea is to drive achievement but that is not the result that I have seen. What I have seen is teams that become more caught up in fighting their supposed colleagues than serving the organisation’s purpose and their customers. I have seen teams withhold information, resources and learning in case they are beaten by others who are supposed to be on the same side. I think these organisations are missing a trick. Rather than setting up competition, let’s reward people and teams for collaboration and sharing knowledge. Let’s mute our enthusiasm when we know results have arisen from selfish ruthlessness, celebrating most when achievements come from working together. 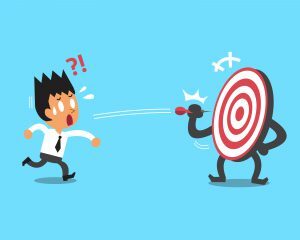 Whether we are in charge of target setting, or the recipient of targets set by others, we have a choice about whether those targets control us and distort our behaviour. Let’s dig deep and work out what our purpose really is and evaluate where we are against that purpose. And then let’s determine how we will act, learn and collaborate to achieve that purpose. If the targets help us, great. If the targets distract then let’s work around them, challenge them and change them. Posted on November 25, 2017 by Jean. This entry was posted in targets. Bookmark the permalink.